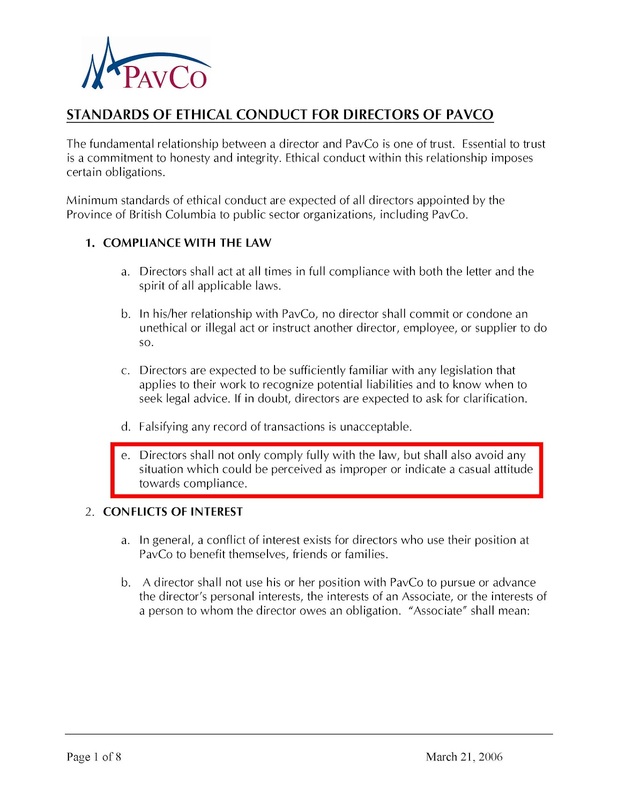 How can BC PavCo’s Board of Directors headed by David Podmore continue to violate the public trust by propping up PavCo CEO Warren Buckley and General Manager Howard Crosley in their flagrant disregard for Vancouver’s civic authority? Buckley and Crosley continue to operate the giant outdoor video screens at BC Place Stadium while knowingly prolonging the suffering of residents in hundreds of adjacent residential households - This despite Vancouver City Council’s unanimous motion on January 17, 2012 demanding that PavCo bring their outdoor signage at BC Place into compliance with the City's sign bylaws. 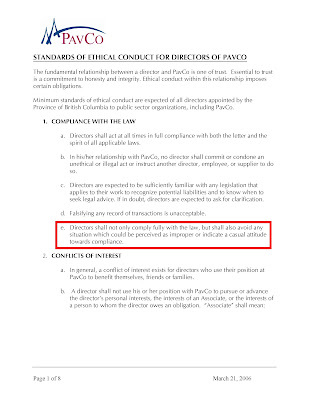 As clearly stated here, even activities which so much as create ‘a perception of impropriety’ are specifically identified as being in direct contravention of PavCo’s own ethical standards. However, despite this clear and unambiguous policy statement concerning acceptable behaviours, ethical dishonesty continues to flourish at PavCo. As PavCo’s Board of Directors begin to jump ship (resignation of Peter Brown and Derek Brindle; speculation of further departures including David Podmore himself), one has to ask how contemptuous of civic authority and how self-important those in power at PavCo must be, to continue their reprehensible disregard for our citizens, our standards and processes, and our laws.